3 - 8 players, determine and take the required card before opponent. 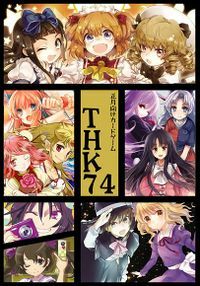 THK74 is a fan-made Touhou Project version of karuta, a traditional Japanese card game. It plays exactly like normal karuta, but it uses Touhou characters and information that relate with characters instead of the traditional theme like poetry, traditional mythical creature and Japanese syllable. There are no specific rule to play THK74, any kuruta rule can be use to play. The rule provide here is basic rule of karuta. Decide one person as the reader. He won't play in the game. Spread grabbing cards (color cards with illust. and name) out on a flat surface, face up. The reader choose a reading card (black and white cards with lots of text). Read any of what wrote on that cards. All players try to find and touch the grabbing card that associated with the said reading card before opponents. Repeat until all grabbing cards are taken. Player with the most grabbing cards win. A complete list of fangames from the Touhou Project series, sorted by genre. 幻想ノ宴 • ちるのい！ • VISION Phantom Magic • 東方混沌符 • Touhou Hanafuda • 夢幻 -Spell of mirage- ～桜華～ Danmaku!! This page was last edited on 12 September 2015, at 11:41.